Heart Felt reusable cloth menstrual pads are a great option for people looking to save money during their period. Disposable pads are expensive, not to mention they don’t biodegrade and are a terrible option for the environment. Another benefit of using reusable pads is that you’re exposing your body to less chemicals as the disposable pads are not made from organic cotton and they contain traces of pesticides. I certainly wouldn’t want my body exposed to this on a regular basis during shark week! Heart Felt is one of our top picks for reusable cloth pads.This company is based in New Zealand and they offer the highest level of customer service-they say that they’ll do whatever it takes to have a happy customer. Most people seem very happy with their purchase if you take a look at the reviews on Amazon. There are a ton of happy customers of these cloth menstrual pads. An outer waterproof layer to prevent any leaks. An ultra-soft charcoal infused inner layer that feels good against the skin. The pads stay in place with a wing-like snap system and most people commented that they stayed in place pretty securely and didn’t shift around. This is unlike some of the other reusable cloth menstrual pads that shift around quite a bit due to the slippery backing. “They are well designed and hold up nice in the wash. I’ve never noticed any staining at all.” Tania A. “I’d recommend these 100% to anyone using cloth pads for the first time. They’re comfortable and absorbent and I also love the darker colors that don’t stain.” Andi F.
“I have some very heavy days on period, but these cloth pads do the trick.” Trudy M.
What’s it Like Using Cloth Pads? 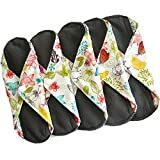 Based on the Amazon reviews, these cloth sanitary pads seem to be of higher quality than much of the competition. Many people commented that they had tried other brands but weren’t happy until they found Heart Felt. Save money-the average person uses 20 pads a month during her period at a cost of around $5-7. These cloth pads can last for years. You’ll be able to recoup your cost compared to disposable in around 5-6 months. Many people were worried about the outer waterproof layer causing them to shift around, but almost all ladies found that they stayed in place nicely with the wings and snap system. These pads hold up nicely in the wash and don’t stain. They are cute and feminine looking. Where Can I Get this Reusable Cloth Menstrual Pad? Some people commented that the packaging contained no instructions or information. There was a strong chemical smell upon opening the package. You should however wash them before first use, taking care of this problem. These pads are not ideal for people with heavy periods, although you could wear them with a tampon or menstrual cup for better protection. They are not breathable in any way which made some people feel very hot and irritated down there when compared to disposable pads. They shift around and bunch up for some ladies. Some suggested putting the pad further forward than you would a disposable one in order to prevent this. The cons of the Heart Felt reusable cloth menstrual pad seem to be common to all cloth menstrual pads and aren’t specific to this brand or company. Heart Felt does put out a quality product at an affordable price and if you’re looking for a reusable menstrual pad, this ones makes a nice choice. It’s a company committed to offering the highest levels of customer service so if you’re not happy with their product, they’ll go out of their way to make it right. This alone makes them work checking out. What are your thoughts about this reusable cloth menstrual pad? Leave a comment below and let us know. Also be sure to give this article a share on Facebook, Twitter, or Pinterest.